Connection to a charity can cloud a fair assessment of anything, so let’s get this out of the way first: Spirit of America, it’s name a somewhat plain-faced tribute to Bourbon’s identity as the uniquely American spirit, gives $1 from each bottle purchase to its own charity called Hope for the Warriors, “a national nonprofit organization whose mission is to assist post-9/11 service members, their families, and families of the fallen, who have sustained physical and psychological wounds in the line of duty.” Very honorable. 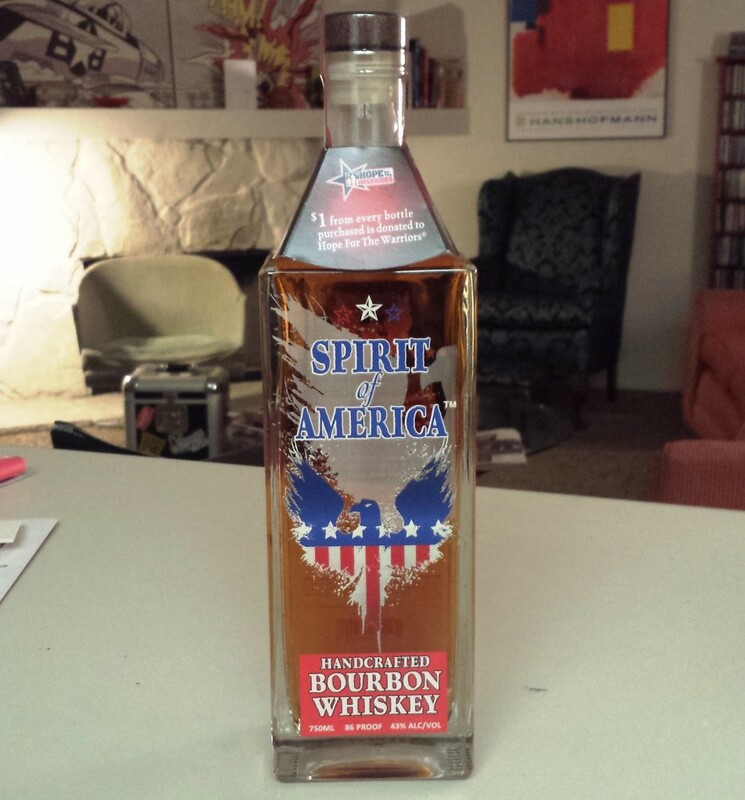 And not only is the spirit American (distilled in Lawrenceburg Indiana, which is not Kentucky but has its own share of bourbon background), but as the press release points out, the bottles come from Missouri, are printed in Chicago, and come with Michigan stoppers. That out of the way, Spirit of American comes in one of those irksome attention-getting squared bottles that have become increasingly popular with micro-distillers but which must be annoying to bartenders, as they’re not remotely comfortable to hold. The labelling likewise goes so heavy on the patriotic bent that its gimmicrky tends to undersell the product. All that aside, the product inside isn’t bad at all. At 86 proof,, it shows a darker copper tinge than one might expect from two years in barrel. Hobson & Roberts distilling reveals the mashbill is 51% corn, 45% wheat and 4% malted barley—no rye, giving it softness and only a baby bite. Cherry candy dominates the nose for me, while the mouth is heavily vanilla, toast, honey, and cinnamon/allspice. It’s won some modest awards, and it’s easy to see why: it is very quaffable either neat or on ice, with just enough character to keep you interested, but not overly so. Undoubtedly it would be an easy mixer. If I had my druthers, I’d rather see it in a more restrained bottle—but if one judges bourbons by bottles, one is likely to be misled in every direction.